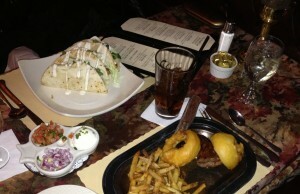 Sizzler steak, Fish tacos. Lunch perfection! Where is the perfect spot to grab a good business lunch, have a romantic evening dinner or pick up a take-out lunch special? Why, its one of downtown Lansings legendary dining locations-The Knight Cap. The Knight Cap on Michigan Avenue has been a Capital City staple for 43 years. And no wonder. The menu is deliciously simple and straight forward with something for every taste and no unrecognizable fancy-pants item names. No doubt about it, this is a steak house, but with some great seafood options as well. With a cozy, intimate atmosphere and superior service its no wonder a myriad of marriage proposals and governmental deals have been sealed with either a kiss or a handshake within those walls. And the old-world charm of leather tufted banquettes for a group and lovely tables for two, white linens and personal service trumps the cool, cavernous, sterile environments of a lot of newer upscale eateries. You dont have to wait for a special occasion. The Knight Cap serves a deliciously affordable lunch and a beautiful dinner. Take a meeting there. Make a date night there. And seal the deal.